You are handed 12 identical looking coins (numbered 1 through 12) and a balance scale and are told that one of the coins is counterfeit. 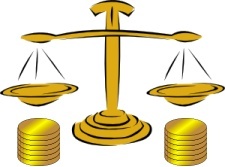 Luckily, the balance scale can reveal the counterfeit coin because its weight is slightly different than the weight of the other coins. Your challenge is to identify which of the 12 coins is counterfeit with only 3 weighings. HINT: The first weighing involves putting 4 coins on each side. Scenario 1: The scale is lower/heavier on the left. Scenario 1A: The scale is lower/heavier on the left. This signifies 1H, 3H, 5H, 2L, 4L, or 6L of which only 1H, 3H, or 6L are possible. You now know that the counterfeit coin is coin 1, 3, or 6. Remaining possibilities for counterfeit coin: 1H, 3H, or 6L. For the THIRD weighing, put coin 1 on the left and coin 3 on the right. If the scale is lower/heavier on the left, coin 1 is the counterfeit coin. If the scale is lower/heavier on the right, coin 3 is the counterfeit coin. If the scale is balanced, coin 6 is the counterfeit coin. Scenario 1B: The scale is lower/heavier on the right. This signifies 1L, 3L, 5L, 2H, 4H, or 6H of which only 5L, 2H, or 4H are possible. You now know that the counterfeit coin is coin 2, 4 or 5. Remaining possibilities for counterfeit coin: 2H, 4H, or 5L. For the THIRD weighing, put coin 2 on the left and coin 4 on the right. If the scale is lower/heavier on the left, coin 2 is the counterfeit coin. If the scale is lower/heavier on the right, coin 4 is the counterfeit coin. If the scale is balanced, coin 5 is the counterfeit coin. Scenario 1C: The scale is balanced. You now know that one of the two unweighed coins in the second weighing (coin 7 or 8)is counterfeit. Remaining possibilities for the counterfeit coin: 7L or 8L. For the THIRD weighing, put coin 7 on the left and coin 8 on the right. If the scale is lower/heavier on the left, coin 8 is the counterfeit coin. If the scale is heavier on the right, coin 7 is the counterfeit coin. Scenario 2: The scale is lower/heavier on the right. Scenario 2A: The scale is lower/heavier on the left. This signifies 1H, 3H, 5H, 2L, 4L, or 6L of which only 5H, 2L, or 4L are possible. You now knoe that the counterfeit coin is coin 2, 4, or 5. Remaining possibilities for counterfeit coin: 2L, 4L, or 5H. For the THIRD WEIGHING, put coin 2 on the left and coin 4 on the right. If the scale is lower/heavier on the left, coin 4 is the counterfeit coin. If the scale is lower/heavier on the right, coin 2 is the counterfeit coin. If the scale is balanced, coin 5 is the counterfeit coin. Scenario 2B: The scale is lower/heavier on the right. This signifies 1L, 3L, 5L, 2H, 4H, or 6H of which only 1L, 3L, or 6H are possible. You now know that the counterfeit coin is coin 1, 3 or 6. Remaining possibilities for counterfeit coin: 1L, 3L, or 6H. For the THIRD weighing, put coin 1 on the left and coin 3 on the right. If the scale is lower/heavier on the left, coin 3 is the counterfeit coin. If the scale is lower/heavier on the right, coin 1 is the counterfeit coin. If the scale is balanced, coin 6 is the counterfeit coin. Scenario 2C: The scale is balanced. You now know that one of the two unweighed coins in the second weighing (coin 7 or 8) is counterfeit. Remaining possibilities for the counterfeit coin: 7H or 8H. For the THIRD weighing, put coin 7 on the left and coin 8 on the right. If the scale is lower/heavier on the left, coin 7 is the counterfeit coin. If the scale is heavier on the right, coin 8 is the counterfeit coin. Scenario 3: The scale is balanced. Scenario 3A: The scale is lower/heavier on the left. This signifies 1H, 9H, 10L, or 11L of which only 9H, 10L, or 11L are possible. You now know that the counterfeit coin is coin 9, 10, or 11. Remaining possibilities for counterfeit coin: 9H, 10L, or 11L. For the THIRD weighing, put coin 10 on the left and coin 11 on the right. If the scale is lower/heavier on the left, coin 11 is the counterfeit coin. If the scale is lower/heavier on the right, coin 10 is counterfeit coin. If the scale is balanced, coin 9 is the counterfeit coin. Scenario 3B: The scale is lower/heavier on the right. This signifies 1L, 9L, 10H, or 11H of which only 9L, 10H, or 11H are possible. You now know that the counterfeit coin is coin 9, 10, or 11. Remaining possibilities for counterfeit coin: 9L, 10H, or 11H. For the THIRD weighing, put coin 10 on the left and coin 11 on the right. If the scale is lower/heavier on the left, coin 10 is the counterfeit coin. If the scale is lower/heavier on the right, coin 11 is counterfeit coin. If the scale is balanced, coin 9 is the counterfeit coin. Scenario 3C: The scale is balanced. Coin 12 is the counterfeit coin. NOTE: The letter H or L next to coin in the scenarios above signify a heavy or light counterfeit coin.